Obama: 'Attackers may have been radicalised' Jump to media player President Obama uses his weekly to address to say that the US "will not be terrorised" by Wednesday's mass shootings in San Bernardino, California. Shooting victim was 'precious' sister Jump to media player Tamishia Clayborn, whose sister Sierra was killed in the San Bernardino shooting, says every time she got to see her sister was "precious". The story of the San Bernardino shooting Jump to media player At least 14 people were killed after gunman attacked a community centre in San Bernardino. Inside US shooting suspects' home Jump to media player The BBC's David Willis is among reporters given access to the house of two people accused of carrying out Wednesday's mass shooting in San Bernardino, California. Shock at attacker's former mosque Jump to media player Hundreds attend prayers at a mosque where the San Bernardino attackers celebrated their wedding reception. Attackers 'may have been radicalised' Jump to media player A married couple who conducted a mass shooting in San Bernardino, California on Wednesday may have been radicalised, the FBI claims. 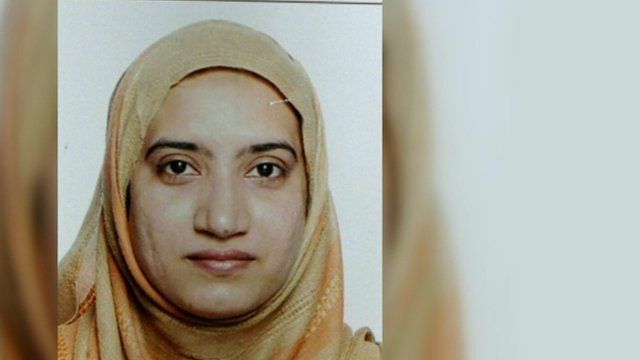 San Bernardino shooting: What do we know about Tashfeen Malik? Details are emerging about the pair that shot dead 14 people in San Bernardino, California. Syed Rizwan Farook was involved in a dispute at a workplace party shortly before he and his wife, Tashfeen Malik, launched their deadly assault. Malik pledged allegiance to the so-called Islamic State group on social media on the day of the shooting, but what else do we know about her? The BBC's Reged Ahmad reports.